The R61 mega road infrastructure project in the Eastern Cape has been completed the South African National Roads Agency SOC Ltd (SANRAL) announced recently. The project, which is valued at R550-million and forms part of a master plan for tourism and other long-term mega projects in the Eastern Cape, started on 16 September 2013 and was completed on 8 September 2017. Upgrade work included the construction of a new 7.3 km dual carriageway between Mthatha and the turn off to Ngqeleni. The east bound carriageway was newly constructed, while the west bound carriageway entailed an upgrade of existing road infrastructure. As a result of the new carriageway there are now six new bridges and two large agricultural underpass culverts were also constructed. 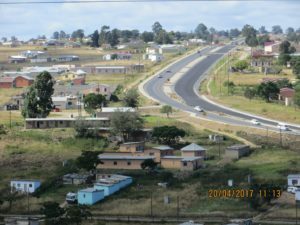 “The R61 Mthatha Sprigg Street to Ngqeleni Turn-off project is one of several projects, each with different starting and completion dates in a mega road infrastructure development and safety programme for the R61 which commenced in 2011, and which will be completed by 2020,” says Mbulelo Peterson, SANRAL Southern Region manager. Peterson adds that the plan is to improve the safety of the road users and pedestrians through the closing of unsafe intersections, a new interchange at Ngqeleni turn-off and the construction of formalised and channelised intersections. This is also an integrated road safety programme which aims to decrease the road hazards which may lead to accidents and motor vehicle accident (MVA) related deaths. The road agency says that the community has already begun to reap the benefits of this project. One of the successes is that the project has already injected a salvo of benefits to members living in villages from Mthatha to Ngqeleni,” Peterson explains. SANRAL delivered 31 new replacement houses to residents whose dwellings fell under the construction footprint, and in the process eradicated poorly constructed structure homes.